Netherlandish painter, the leading artist of his day. He is thought to have trained in Brussels and seems to have returned home through Antwerp. 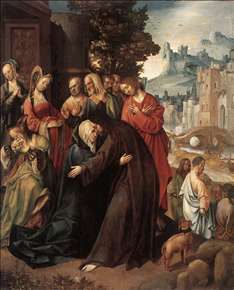 Although his style shows the influence of the Italianate tendencies prevalent of Antwerp, Engebrechtsz. s work has a deeper intensity of feeling that is Gothic rather than Mannerist in spirit. Contorted linear rhythms and resonant colouring characterize his highly personal art, which is closer to the Master of the Virgo inter Virginis than to any Antwerp artist. 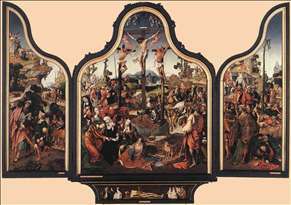 The altarpieces of the Crucifixion and The Lamentation in the Municipal Museum, Leiden, are typical of his works. 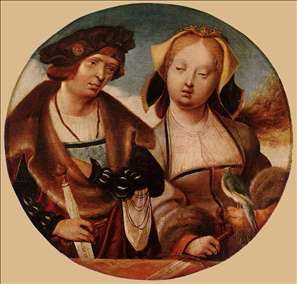 Lucas van Leyden was his greatest pupil and tends to overshadow his achievements. 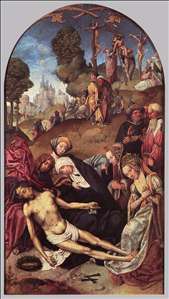 The other pupils in his large studio included his three sons, Pieter, Cornelis, and Lucas, as well as Lucas van Leyden s brother, Aertgen. See more details about "St Cecilia and her Fiancé"
See more details about "Christ Taking Leave of his Mother"
See more details about "Crucifixion Altarpiece"
See more details about "The Lamentation"